One of the most embarrassing thing my kids like to do is to talk about their favorite junk food. Embarrassing because everyone knows that I have a blog for healthy eating for kids! My 15 year old used to tell people his favorite food group is candy! Ugh. But recently, he started declaring his love for commercial top ramen! They were turned on to it when we had a Japanese exchange student a few years back, and now they would really like me to buy some. There is literally nothing redeeming about commercial Ramen. With 1660mg of sodium, and no veggies to speak of, they might as well be eating a brick of salt. Making our own Top Ramen, while considerably more expensive than the commercial kind, can be much healthier for kids. We can make it with extra vegetables and a negligible amount of sodium. Our kids do not need more than 1500mg of sodium PER DAY!! Sodium, while a necessary mineral, becomes toxic at the levels we are consuming it today. 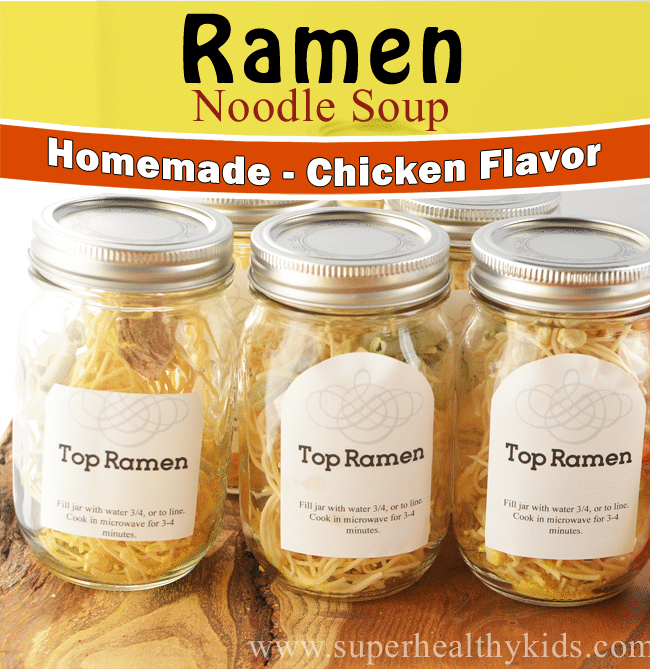 So, of course, in our final series this week of homemade versions of our kids favorite foods, I chose to re-do their favorite “make it themselves meal”, and make our own top ramen! 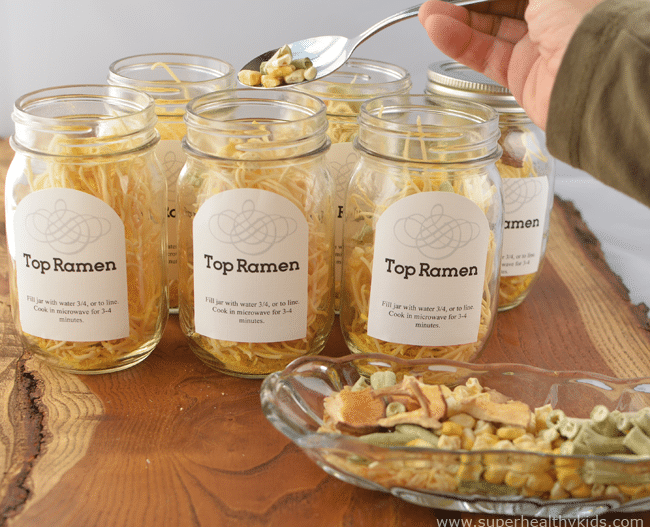 This Homemade Top Ramen Recipe is actually much easier than you might think! In fact, it literally took me less than 5 minutes. The benefits to homemade: LESS SODIUM & MORE VEGGIES! Dehydrated vegetables! These were not easy to find!! We had some from food storage. We used Freeze dried corn, freeze dried green beans, dehydrated mushrooms, and dehydrated onions. 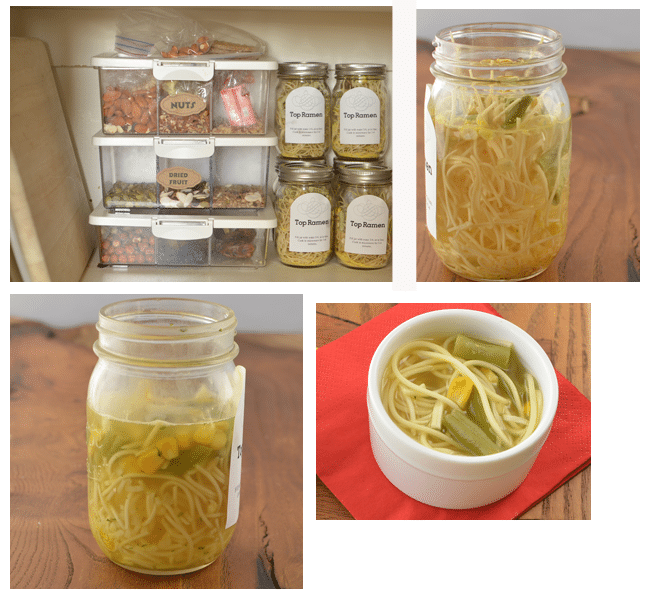 I added 1 cup of the chow mein noodles, 1 packet (or 1 teaspoon of my sodium free broth), and a handful of dried veggies to each jar. Then, stuck a label on them, and put it in the pantry. At meal time, kids can fill the jar with water, and microwave. The jars do get hot. Either transfer to a microwave safe dish that does not absorb heat, or remove the jar yourself with a hot pad. Shall we look at the comparison? That’s it! 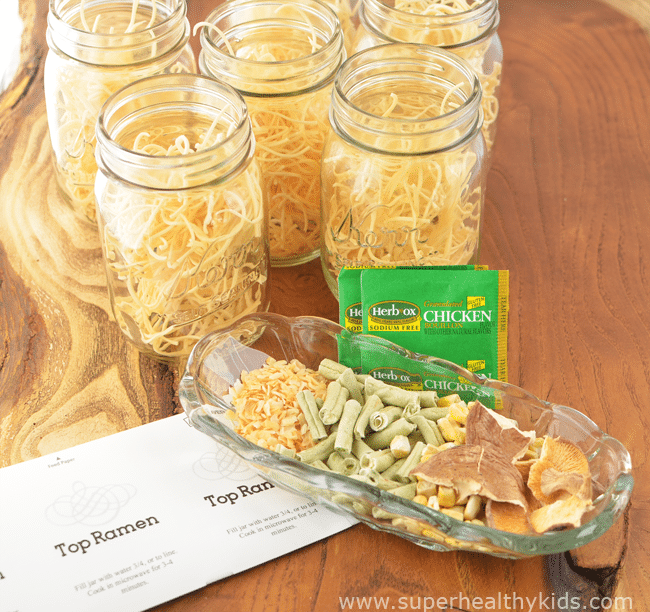 Super easy, and much healthier for your kids! For more of our commercial food makeovers- check out our DIY category here! Place all ingredients in pint sized mason jar. When ready to eat, fill with water and cook for 3 minutes in the microwave. Why does it need to go in the fridge? Oh my! I did Not realize I wrote fridge! Will fix it now!! No, the noodles aren’t packaged with any seasonings. You could use the noodles that come with the seasoning packets, but I heard they were fried. These are just dried. more questions…(1) Do you know of any stores where I get a small amount of dried veggies?. (2) How does it taste without veggies…just the bullion and noodles? If you have and amish store near you. You can buy everything you need in bulk from them. If you live in utah, you can get dried veggies at kitchen kneads in West Jordan. Thanks Catherine- We ARE in Utah, so I’ll check it out! Herb ox boullion is full of other bad chemicals isn’t it? You can just heat water up, poor it in the jar and shut the lid. The Ramen will cook, takes about 5 min. We don’t use a microwave so we have been doing this for years with regular Ramen in a bowl with a plate on top to cover them so that the heat stays in and they cook. Works great! No extra dishes this way, I would hate having to wash all those jars! You guessed it, no dishwasher anymore either! :-)! Welcome Linda! Thanks for joining us here! Michele, it does have msg.. I will keep looking for better brands. Do you know any? I have the same question. I often just purchase the ramen and use about 1/4 of the packet, because I assumed all the bad stuff (ie salt) was in the packet. I will add my own veggies to the noodle. So is there really a need to come up with different noodles? Looks like the noodles alone in one packet have 1000 mg of sodium. DeeAnn- I understood that Ramen noodles are lightly fried and then dried! If you have noodles that they don’t fry first, then you can definitely use the noodles that come packaged like that- they definitely are much cheaper! Trader Joe’s has liquid bouillon without MSG, but its a liquids…probably wouldn’t work for this recipe unless you were making it fresh. Thank you for this recipe! 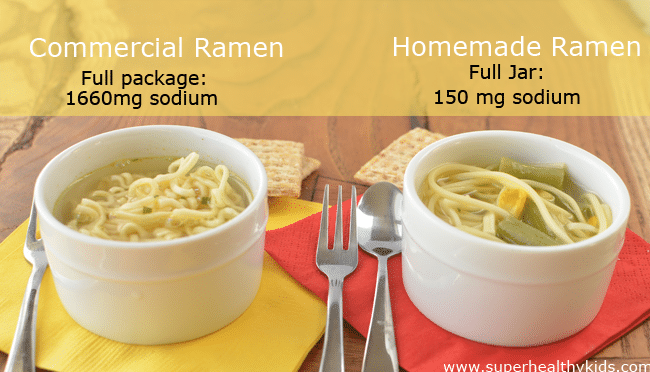 We love Ramen but try to avoid it because of the crazy sodium!! If you don’t mind ordering online I found that Amazon has some dried veggies for not too bad a price. I tried this and my 5 year old didn’t like it, but then I tried using the low sodium bullion with the Ramen noodles instead of the packet it comes with. Score! I always add frozen chopped broccoli so the dehydrated veggies just tasted wrong. I’m excited about the low sodium bullion. She’s been eating it for months now (twice a month). Freeze dried broccli is much better than dehydrated. Looks and tastes closer to fresh. Broccoli is perfect to include! Unfortunately even the ‘organic’ brands have MSG. The only way to get broths or boullions without, is to make your own. They may say “no MSG added” which means one of the ingredients they used already had MSG in it, therefore they did not add it themselves at it does contain MSG. “Yeast extract” is an ingredient they use to hide MSG, this will always mean it contains it. Just a few minutes till the noodles are soft Jessica- just depends on what type of noodles you buy. My problem with ramen noodles is that they have wax or whatever as a coating that’s supposed to be horrible for your gut, do these? Also wondering if the texture is the same? The wax thing is absolutely a myth. The residue you see in the water from cooking ramen noodles is residual oil from frying, and on occasion oil that is added. When you buy high end ramen that has less oil in the noodles, it comes with an oil packet to add, because the noodles are designed to have oil in them. Kinda like when you cook spaghetti in oil, or toss it in a pasta salad to keep the noodles from gluing together. Sandra- We don’t have a recipe for homemade bullion- we used the Herb-ox brand pictured above. Also, Ikea for the boxes! Chow main and ramen noddles are not the same . Glad you found a health way to eat you chow main. I hope some day you find so ramen noddles to try. Juliee Clapp, Trader Joes sells pasta made out of corn that is gf. I served it to my husband and two teenage sons in place of spaghetti and they didn’t even know the difference! Two really good GF options for asian food are rice noodles and buckwheat noodles. Rice noodles make a good broth disk, but are more like thai noodles than ramen. If you can find straight up buckwheat noodles, without added wheat flour (buckwheat is not real wheat and is actually GF) that is your closest substitute for similarity. Of course, you could always go with a GF spaghetti type noodle, but to me it is just not the same. Couldn’t you make a seasoned broth in advance, freeze it & then cook it on the stove, adding the noodles once it’s hot? Ramen and Chow Mein noodles, while similar, are not the same. You can actually buy individual, healthy, ramen style noodles packaged without seasoning if you have a local Asian grocer. Houston has a large Chinese population, so over here we have several to choose from. Most large urban areas have a china town district of some form, or at least a small grocer. Even some of the major chain grocery markets like Kroger or Randalls are getting better with the selection in their international foods departments. When we make ramen, we don’t even use bullion at all. Instead of water, I cook the noodles in low sodium chicken broth and add frozen vegetables. I’d like to use labels on my jars as well but the Ball jars are not smooth and I don’t like the way the labels look. What jars do you use? Wow great idea to nix the sodium. I’m from Hawaii where we all grew up on Ramen/Saimen. Its a local staple food here. We eat it dry, fried what ever… So in my quest to lower my sodium I Googled , and your receipe popped up. Thanks simple and very low in sodium! Awesome! This is completely off topic but where did you get those stackable snack organizers? Those are perfect! Hi Becky! Those are from Ikea! Wow, I can make this for my grandkids. Thank you for your efforts.